Caring for an elderly parent or family member requires a lot of focus on their health. That includes the state of their teeth and gums, either of which can impact their overall health and quality of life. 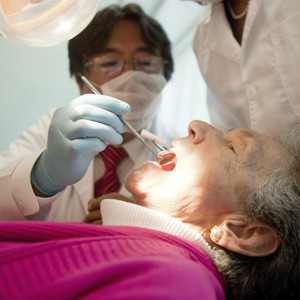 As we age, our risk of dental diseases like tooth decay or periodontal (gum) disease rises. Loss of teeth due to disease can impact diet, speech and, of course, our smile. There are also links between dental disease and other systemic conditions like heart disease, diabetes or arthritis, for which the presence — or absence — of oral care can have a significant effect. As at any stage of life, good oral hygiene and care in our later years are essential for a healthier mouth. For many older people, though, this can be a challenge as tasks like brushing and flossing may become physically demanding. So it’s important to introduce adaptations to make brushing and flossing easier, like attaching a bicycle handle grip on a toothbrush or using a water irrigation flosser rather than floss string to remove plaque from between teeth. There are also health conditions that could affect our mouths as we age. Chronic dry mouth (xerostomia) may develop, sometimes resulting from medications, with the resulting drop in saliva increasing the chances of tooth decay. Gastric Esophageal Reflux Disease (GERD) is also prominent in older adults and can cause stomach acid to come into the mouth and cause enamel erosion. As your loved one’s caregiver, you’re part of a unique partnership with us as their dentist. As such, you can have a positive influence on their oral care: offer to accompany them on dental visits; be sure you’re up to date on their medications, supplements and medical history in case there are questions; and be sure to bring along all of their oral appliances. We in turn will screen for oral cancer and other signs of dental disease, check appliance fit and monitor the effectiveness of their hygiene habits. Together, we can make sure they’re getting the very best oral care they can, and have a positive impact on their health and quality of life.